Moreover, if you're short on counter space in your kitchen, you can put the dehydrator in any room in which you have an electrical outlet and don't mind the fragrance of whatever you're drying. I used to run mine in the guest bathroom with the exhaust fan turned on. If you'd like to get started, be sure to read my tips for buying a dehydrator. You don't have to invest in a large-capacity dehydrator; reliable models can be purchased for around $50. But if you're seriously into dehydrating, Excalibur is the way to go. Let me know by posting a comment below if you're interested in other jerky recipes! Mix all the ingredients except the chicken in a gallon-sized ziplock bag. Add the chicken strips, seal the bag and ensure that all the meat gets coated with marinade. Place bag in the refrigerator for about 20 minutes. Place the meat strips on dehydrator trays. Dry at 145 degrees for 5-7 hours or until completely dry (length of drying time depends on thickness of strips). This reminded me that my Asian roomie used to get some kind of dried meat from home that was spectacular--I have no idea what it was, but it was probably much closer to this than slim jims. I'm going to try it once I get my dehydrator; do you think the one I'm going to get is any good? I think the one you're getting (and I just pulled it from the basement, btw) will be fine. AND you can say that you are actually the owner of an honest-to-god RONCO product!!!! I'm so pleased you liked it, Janelle -- thanks for posting such a happy comment! Sounds great! Is your turkey recipe about the same? Hubby needs to go on a diet and these will be great snacks for him. Yes, I do turkey the exact same way. Hope your husband enjoys the jerky! Is it not necessary to cook the chicken first to kill salmonella? T_Bone: No, it isn't, because you are making jerky, not simply drying it out. The curing (with salt or salty marinades that include soy sauce) followed by drying (the jerky process) essentially "cooks" the meat enough to eliminate the risk, from what I've researched. If you are still concerned, feel free to cook the chicken first but the flavor and texture will likely be different. I didn't think about this. I was making for my dog and didn't use soy sauce because most sauces have onion in them and onion is toxic to dogs. Do you think dipping in vinegar would kill salmonella and bacteria. No, the vinegar won't accomplish the same thing. Also, I would suggest you read the labels on available soy sauce or tamari in the store: none of the ones I've seen or used contain any onion. As I've said, my dogs have been eating this for YEARS and I certainly would not give them anything I thought would be toxic (and yes, I'm aware of the onion issue). Anon, you might be thinking of soy based premade marinades, such as a Teriyaki marinade (not sauce) or such that you can buy in stores for dinners made easy. No soy sauce that I have ever seen made has ever had onion in it. Also, you can make a salt based cure that can then be rinsed off before the drying is started if you are still concerned. Many simple salt based cures can be found that are used in all sorts of charcuterie that have no soy product in them whatsoever :) happy curing! @Kitchen Ninja: Actually, vinegar will do the same thing as lemon juice. Both denature the meat, although vinegar isn't nearly as strong. Lemon has a pH of around 2, while vinegar tends to be around 2.2-2.5. Increase the amount and let it steep a bit longer. As for soy, it really isn't necessary. It does have lactic acid bacteria and plenty of antioxidants, but it's definitely something you can skip, if you really don't want it. You had mentioned that if anyone was interested in some of your other recipes, to ask. I am asking..Please. I have deer meat and would like to try just about anything else you have recipes for. Will check back. Thanks! I have some venison (and a marinade) that I need to jerkify, so you are in luck. Check back or, if you're in a rush, send me an email at kitninja at gmail (dot) com. This was AWESOME! I just made some today and it only took 5 1/2 hours in my dehydrator. I was skeptical at first but now i am a believer. I want to make it a little bit spicier but other than that, it tasted wonderful. I took it to work and everyone loved it! Thanks for the tips! Great! So glad you're a new convert to chicken jerky! I've been looking for a good chicken jerky recipe! Most I find are for dogs O.o I made this last night. It's FANTASTIC! I think I cut the chicken too thick, but I did it as thin as I could :/ I also would like it a little spicier, but I'm looking forward to experimenting! Maybe teriyaki? YUMMMM! Thanks for this post! My poor husband may not get any if he doesnt wake up soon! Thanks for taking the time to put this together. I was worried about salmonella or however you spell it, as well, but you put my fears to rest, got the chicken marinating now and going to put it in the dehydrator in 20 min. How long and at what heat do you suggest if I do this in an oven? I have read a lot of variety, anywhere from 140 to 200 degrees F. And from 4-8 hours. Since I've never used the oven-drying method, I can only make some guesses. I'd probably start with 200 degrees (since the oven won't be fan-circulating the hot air like a dehydrator) and assume it will take longer than the dehydrator -- but check it for the consistency you like after at least 5 hours. Good luck! Perhaps one could use the counter-top convection ovens for air circulation? I think I'll try that as well as my regular RONCO. yum! Will try this. I want to try fish. I have northern in the freezer think that would work? If you could email me a recipe I would be so grateful! I'd love to hear what you do for fish jerky. I had a sample of shark jerky years ago and was surprised how good it tasted. My husband often brings home blue fish which is pretty gamey when cooked like other fish and would be interested in trying it as a jerky. Plus it would free up some freezer space! Okay, everything I've read about jerking chicken is "don't", because of the chance of salmonella. Is it because of the temp. and time that your recipe is okay? I just want to make sure. Wish I would have seen the over the weekend. We just butchered 25 chickens and I barely had room for them in my freezer, this would have helped a little. Do you only use the tenderloin, or would it work with the breast meat as well? Given the interest in fish jerky, I'm going to make some and write up a new post -- stay tuned! @Anonymous: I have used chicken breasts, not just the tenderloin, and it works fine. @Ditzy: I already answered this, so I'm just repeating my earlier comment... Salmonella is less of a concern because you are making jerky, not simply drying it out. The curing (with salt or salty marinades that include soy sauce) followed by drying (the jerky process) essentially "cooks" the meat enough to eliminate the risk, from what I've researched. If you are still concerned, feel free to cook the chicken first but the flavor and texture will likely be different. I would love to get some of the other recipes you mention, I have a lot of dead things that need to be preserved to be eaten later, and my 7 year old son is a jerky junkie. Think of the savings! Can you post the venison / beef / fish / duck / goose versions? Can you tell me approximately how long this will keep without refrigeration? And how much longer it would keep in the fridge. Over the winter I made some venison jerky (with game, *be sure* that you freeze it at 0 degrees for 60 days before using it to kill any bacteria that might be present). Create a marinade of 1/4 cup cider vinegar, 4 tablespoons Worcestershire sauce, 2 tablespoons brown sugar, 1 tsp salt, 1 tsp garlic powder and 1/2 tsp pepper -- add 1 pound of venison, cut into thin strips, and marinate for at least 8 hours. Dry at 145 degrees until hard. It was yummy and, again, my dogs went crazy for it. Let me know if you try it! This is great information. Any way to get it in printable format? Thanks! Another good idea (this is what I use quite often when making jerky) is using ground beef (it has to be lean, like 94% lean with 4% fat), turkey, and chicken. Add cure and seasoning, let sit for 24 hours; when ready, take two sheets of plastic wrap and a rolling pin and press the meat as thin as you can get w/o making the meat so thin it falls apart. It takes some practice, but it works out quite well when you get it down. That is a great tip -- thanks! What a knock-em-out-of-the-ballpark tasty recipe! THanks for sharing. ... I tweaked it in 2 ways: 1, by adding agave syrup to the soy mixture, and 2, by putting the strips of meat on parchment paper, atop the drying screens. Controls drips, makes cleanup easier, and because strips are so thin, dries with no problem. I'm a red meat kind of guy but I made chicken jerky for the first time last night (though I changed up your spices a bit). It almost pains me to say this but I think I actually prefer it to even my own beef jerky. Make this. You'll love it. Given all the issues reported with chicken strips for my pets from China, today I hit Costco and bought thigh meet at .99/lb marinated for an hour then into the dehydrator. Our dogs love it and we know exactly what they are eating. I love the fact, Robert, that both the dogs and I can have the same snack, especially on road trips! I'm allergic to all meat except chicken and soy is nasty so I really want to try this but I am also allergic to ginger lol, so is ginger nessesary or just a flavor component? Feel free to just leave out the ginger. I hope this recipe works out for you! Too die for recipe!! My dogs and I are huge fans, thank-you!! i was skeptical----raw chicken and only 20 minutes marinating. Can Bragg Liquid Aminos be used in place of the soy sauce? Sorry, but I'm not familiar with that at all so I can advise on the substitution. Try googling a little bit perhaps? I used Bragg Liquid Aminos. WE (humans) and DOGS LOVE IT! No problems at all. Braggs is Soy Protein. WOOHOO!! 200 degrees for 5 hours in the oven with the oven door cracked. AWESOME! I use kosher salt. Please see the comments above, in which I gave my recipe for venison jerky. Let me know if you try it!! I just bought a dehydrator to make chicken jerky as treats for my Yorkies. Found your recipe and now I make it for all my friends too! This marinade is awesome! Sadly my Yorkies very seldom get any because its eaten so quickly! Do you have a recipe for beef that you could share? I'm happy to hear that your Yorkies love it -- I love the fact that it is equally loved by both dogs and humans alike in my house. Unfortunately, I don't have a beef jerky recipe (at the moment) that would be suitable for dogs because they all contain some form of onion or onion powder. I'll try to come up with one, though, so check back. I must've done something wrong. my jerkys are brittle and the dog needs assistance or he chokes he has problems chewing them into smaller swallowable pieces. I run them under hot water to make them more plyable but doesn't help. Poochlover: it sounds as if you might have dried them for a bit too long. They should be somewhat brittle, though, not flexible / chewy. If your dog is small or having a hard time with the big pieces, just use some kitchen shears to cut them into small bites. I was wondering what temp I would do these in the oven. I don't have a dehydrator although I think it may be something we save up to get! Also, how long will this jerky keep if not in the fridge after its made? Thank you!! Can't wait to try this recipe! I've made this so many times for my dogs, I got tired of cutting into strips so I put tenders between wax paper and flatten with rolling pin, they come out great. I don't dry them until they are brittle, just good and pliable, and I keep them in the freezer. I love getting this kind of feedback -- so great to hear! I have heard that you can make Bacon Jerky. Has anyone tried this, and if so is it good? Thanks. Do you have to pre cook the chicken first before doing this or you just don't cook the chicken? I've been a fan of homemade jerky over the years -especially those that offer alternatives to beef. But I have never found a recipe as easy or as tasty as this! AMAZING! You mentioned in one of your earlier posts that you might have a recipe for fish jerky -or could this one be used? Thanks for a great protein snack option. I hope I will be able to try it. I'm not able to have soy sauce. Can this be made without the soy sauce? If it's safe to make it using just salt, how much would I add to this recipe, and is sea salt okay to use, or does it need to be kosher? Also, thanks for answering everyone's questions. So glad I found this. You can definitely make it without the soy, but it won't really have any specific taste and you won't have any marinade -- perhaps use a salt-water solution instead? I can't vouch for that AT ALL, though, since I've never tried it. If you're avoiding soy because of gluten issues, you can substitute tamari instead. Sea salt vs. kosher is fine, too. Hope this helps. It was awesome with the coconut aminos, by the way! I have an OLD dehydrator without temp settings or a fan. I left it in for probably 11 hours (with a slight opening at the top) and some pieces were a bit black - oops! Anyway, still learning :) thanks for the easy recipe! I use Coconut Aminos as a sub for soy sauce for my beef jerky. CourtnieMarie - did you precook the chicken? Since the Coconut Aminos have a very low sodium content, I am wondering if they don't accomplish the curing process and expose us to a risk of Salmonella? I would imagine you could dehydrate to doneness, then pop into an oven for a brief time to heat it to ~160 degrees. That would kill any salmonella. Although all the salt in the marinade would likely make short work of any bacteria present. went through your comments and did not see anything about using ground chicken. I have gun to make strips with the ground beef, so I was wondering if ground chicken can be used using the gun to shoot the strips onto the dehydrator? I've never tried it, Joyce. I'm sure it would work, but I bet it would take a little less time than the non-ground chicken. Let me know how it goes! I just bought my first dehydrator to make chicken jerky for my dog. I made it with ground chicken and mixed the package of Cure that came with the dehydrator, no other spices. I dried it for 7 hours. It had a great texture and thought it turned out well. Then I read you should use cooked poultry. Is this true? Seems weird to me. Also, my dog loves it but always drinks water immediately after. I tasted it and doesn't seem salty. Could it be something wrong with the Cure? You will always find someone who will say that you should not use raw meat. I and many others have been feeding this jerky, using raw chicken, to our dogs for many years. And I can't comment on "Cure" because I have no idea what it is. Sorry, I can't speak to the safety of the method you described. I have 2 dehydrators. Ronco which I use for meats and Nesco used for veggies and fruits. Another tip for the die-hard food driers. I use a meat grinder with a double tube adapter to make string jerky, groud meat dries a little faster than sliced. Not to mention I am able to blend meats together for a better tasting jerky. I have jerky from 3-5 yrs ago using seal-a -meal and it still very good. I use a little different marinade and I usually let it set in the refrigerator for a couple of day. The longer you marinade the more tender the meat. This way you can use the cheaper cuts of meat and shop the specials. Great suggestions -- thanks, Chris! Do you grind your meat after it has been in the marinade? Any idea on shelf life? Or better yet, shelf life is the jar you store it in is vacuum sealed, or you make small vacuumed sealed individual packs. I'm thinking about long term storage for emergencies. Robert, I think the shelf life if vacuum sealed would be quite long, but I can't say exactly, sorry. We always eat all of it within a week or two because it's so yummy! Have a small Pom that loves jerky for her "go to bed" treat. Just wondering about the amount of salt for a small dog. My vet said not to feed her any more of the "made in China" jerky. The only salt in this recipe comes from the soy, which is why I use a low-sodium version. I feed this to my dogs ALL the time but they are 50-ish pounds. If you give her small pieces, I'm sure it will be fine. And yes, your vet is right -- make your own jerky!! 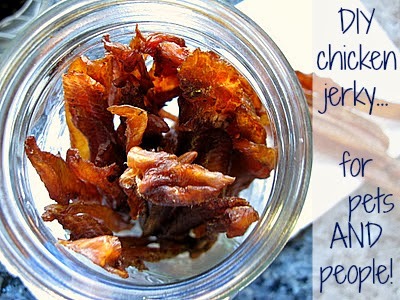 Great post and recipe on Chicken Jerky! I see Chicken Jerky isn't all that popular but I think it makes a great budget jerky because beef isn't very cheap. I've got a burning question though! You set your dehydrator to 145F (62C) and yours look absolutely delicious (pink and translucent)! However I'm seeing most recipes and manuals of dehydrators say 155-160F (68/71C). I just had some chicken breast in to test at 160F and it looks more white than pink. I've a batch of chicken breasts strips marinating with Alton Brown's Beef Jerky marinade and I'm hoping to get them to look like yours doing them at 145F! Is it alright to set the temperature to be 145F and have you tried 155/160F? Thanks alot! Great blog! I'd want to try the watermelon strips! I always make this jerky at 145 degrees with no issues/problems. I think that 160 would be too high / too drying. Good luck -- and be sure to try the watermelon slices -- they are YUMMY!!! I know someone said they have made buffalo chicken jerky, but I didn't know if that would kill the salmonella since your not using the soy/salt that you would normally use. This jerky was so yummy!! I cannot wait to make it again and again! I dare say I may like it better than beef jerky! Oh my! I can't wait to try your recipes! I was given a dehydrator about 10 years ago (because I asked for one) and have never used it! Now I will. If I want to use ground chicken (grinding myself), would I put the chicken pieces in the marinade first and then grind the chicken when it is finished in the marinade or grind it first and add the marinade mixture. I was going to use a jerky gun to make strips like you would with ground beef. I have been making jerky for years (primarily venison as I'm a deer hunter) but now that I have moved to TX where it seems for prevalent, I have started to sell it. I was actually searching on-line as I was concerned about semolina with the chicken jerky. I feel more comfortable learning that the cure and the high temp drying time makes it safe. I did however find one site suggesting drying in the oven at 160 degrees for 30 minutes. At any rate, I recently bought 4 chicken breasts with the bone and deboned them. I have my own base marinade but decided to add fresh squeezed lemon and cracked pepper (lemon pepper chicken) to them after laying them on the trays and it came out great. You can also pick up a Food Saver vac and seal it up in 2 or 3 oz bags which allow you to savor that fresh flavor for months. I also ship to family members and friends as gifts. OK - this was a bit long and I could go on. Maybe one day you will see my Jimmy Links!! Oh - I love the idea of making it for animals as well. You can never be too safe the animals you love! if you are paranoid about bacteria, you could always add 1 tsp of Instacure or Pink Salt per 5lbs of chicken. Besides being an incredible antibacterial agent, it keeps the meat supple and imparts a great color. if you have an old style oven with a pilot light, you don't even need to turn the oven on. I dry everything [jerky, fruit, veggies, etc] with just the pilot light, and it works fine.Slightly longer, [2 days], but I am using energy that is just wasted otherwise. I saw some comments above about the dog treats frm stores. that is why i looked up this recipe and i love jerky myself so I am making a big batch for me my felines and doggy. Id love more. I love this jerky- have found that whole Chicken Tenders do not need slicing or dicing. They come out just fine with my $35 dollar dryer set out on the covered porch over night. Both our big standard and mini Poodles love the larger size. Sure -- it will SUPER flavorful but I don't see why not. My jerky was much darker in color than yours. Did you use a light colored soy sauce? Mine was even darker than yours when it was marinating in the zipper bag. Did you rinse the marinade off? I sliced it from frozen on the electric meat slicer and they sliced very thin with no problems. The jerky tastes great. Thanks for the recipe and the tips. SO i made mine in the oven. I have a trick with a usb powered fan that gets good airflow in my oven and i have a pastry fan in the oven as well. i did a little different recipe and im gonna say i like this more than my beef. i hang my meat on skewers and that gets the air all around the meat to really dry it out. gets a crispier shell with a nice chewy interior full of flavor. i will post recipes as i make new batches. I have read several recipes (including yours) that suggest drying the chicken strips in an oven at 200 degrees F. This is good for those of us who don't own a dehydrator! Just want to say, if anyone is worried about bacteria: all cookbooks will tell you that chicken must reach an internal temp. of 165 degrees or so in order to be safe to eat. It is often printed right on a meat thermometer for convenience. I'd guess any thin slices of meat that were heated in a 200-degree oven for several hours would probably reach an internal temp. that high, so it shouldn't be an issue. Looking forward to making some chicken jerky. Thanks for the recipe and comments. I hadn't been making chicken jerky for both of us so was simply cut and dehydrated in Excalibur for the dog. Never had a problem but may try this for myself. For beef jerky, if you can get past the eww factor then heart is a great choice. It is lean(cut off outer fat if any), inexpensive, and tasty. I'm not a fan of salt, soy used only minimally. I've been creating a marinade of pineapple juice, little apple cider vinegar, molasses, soy sauce and few dashes liquid smoke. The proportions change depending on amount I'm marinating. I always freeze the heart first(kill pathogens), then maybe and drying have worked fine. I store in glass jars but never lasts long. It is now my favorite cut for jerky. Thank you for sharing us your recipe. The food looks delicious and so attractive. I would like to try this one. You did a great job in explaining the process, it so easy to understand. i found your recioe and made some chicken jerky. it is mostly for my friend's mini schnauser, but i really like it and so does my snoeshoe kitty. i cut the breasts with the grain. next time i am going to try chicken thighs. Until now I thought that you couldn't make jerky from poultry because of the danger of bacteria, but that you've explained that it needs to be cured in a salt solution first, it makes total sense and now I'm interested in trying it. I smoke and slow BBQ a lot of meat so I tend to brine everything, and my basic brine is 1 cup of sea salt per gallon of water; do you think that is enough salt to cure poultry to make jerky? Does any one have experience with dehydrating with a wood stove? I have a wood stove that will soon be lit for about 150 days straight for heat but cook all sorts of stuff on top just about as fast as the stove. Rice, potatoes, eggs whatever. I had though about making jerky with it but the top temp may be too high. I'd suspect if you had a contraption that would lift your trays to a height where the average temp at all trays was around 160-170, it'd work fine. maybe add a collar or something that will direct the heat to your meat. Thanks for this! I've been grinding my own for awhile now but didn't know about chilling the parts before using. Great!!!! I am thinking of redydrating this in soups and such (with a modified spice selection) when back packing. Good idea or yuck? It does work if you chop the meat very fine or grind it for a broth though. You just won't get meat chunks. I've used baggies of ground dehydrated meat and chunky dehydrated veg just fine. It's not something worth doing on a home front usually but for backpacking or home-emergency prep it's great. Man, I made this for the first time a couple nights ago. I left it on too long and the jerky got nearly brittle. It is still tasty, just dangerous! SO, I soaked them in red wine for about 30-45 min then drained, patted dry. Now, they're the perfect texture and taste amazing. Great recipe, salmonella will die if the temperatur is 170 f for one sec or 125 for min. 20 min. So chicken jerky is safe after a trip in the dehydrator.